Engineers working on the preservation of cultural heritage, confronted to the ubiquitous demand for the restoration of historic and monumental buildings, need transdisciplinary and efficient methods for the study of ancient, yet highly complicated, structures. The severe 2014 Kefallonia earthquake, in combination with the vulnerable, in terms of geometry and materials, structural system of Basilica churches resulted to severe damage in two significant post-byzantine churches: the Basilica of Saint Marina in Soullaroi and the Basilica of the Virgin in Roggoi. 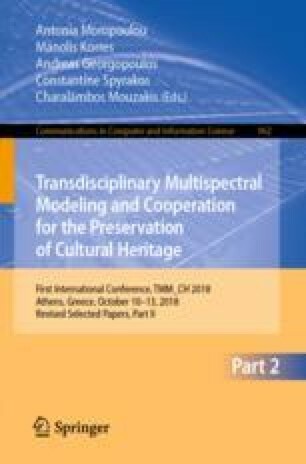 The restoration study presented in this paper, performed by the architects and the engineers of the Directorate for the Restoration of Byzantine and Post-Byzantine Monuments of the Ministry of Culture of Greece, was carried out by following several successive research stages in order to result in a detailed intervention project for these Basilicas. The project was based on the digital representation and modeling, the architectural-morphological analysis, the historical survey of these monuments, as well as of similar buildings of the Eptanesa Island Complex and on the study of the construction technique of the two Basilicas. The monitoring of the damage patterns in comparison with the results of structural analysis and response under seismic loading, led to the adoption of intervention measures in order to repair and strengthen the masonry and the wooden structural elements of the Basilicas. For the restoration of the studied Basilica Churches of Kefallonia, which are considered as two of the most representative post-byzantine religious monuments in Greece with occidental architectural elements, techniques and materials for the consolidation of the structural systems have been proposed, in accordance with the limitations imposed from the monumental character of the churches for sustainability and reversibility, while fully respecting and safeguarding their authentic architectural and structural features.